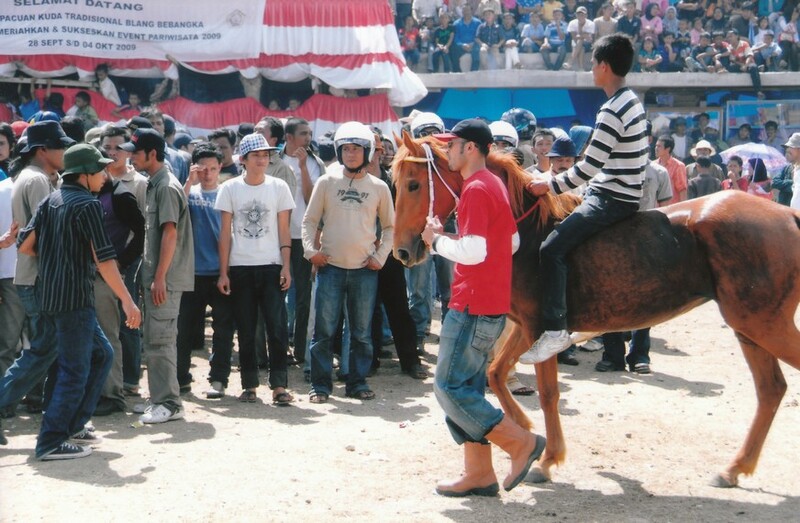 Traditional horse racing Gayo held twice annually in Central Aceh, Indonesia, in February and September. In addition in Central Aceh, Bener Meriah Regency Gayo Lues Regency, and they also organise Traditional Horse Race Gayo, but they held a race just 1 years and the horses in from 3 counties that always participate in this event. Horse races have been held since the Dutch colonial era, they hosted the competition after their harvest season, and surprisingly again, riders included are children who still sit in the junior school and while on horseback they didn't wearing a saddle. This year, horse racing event in the town of Takengon, into a series of activities Gayo-Plinth Mountain International Festival (GAMIFest). Recorded as many as 354 racehorses from three districts in Gayo Highlands took part in traditional horse racing event held in the grounds of HM Hasan Gayo this season. The young Jockey mutually pitted speed on the racetrack. Despite the rainy weather, but not turned their passion. Besides the traditional horse racing event is the annual agenda town of Takengon. Within a year usually runs twice, namely to enliven the days so the city of Takengon and commemorates the independence day of the Republic of Indonesia. It was held regularly to give spirit to the breeders to take care of the horses and gave birth to the riders. I hope Indonesia should be able to become a producer of horses, the horses during this time many are in from the outside, with the cost being prohibitive, so Indonesia must now become the producer of his own horse, this would be an expensive purchase value and racing the horse should accommodate the interests of the community, so the runway can contribute greatly to this horse to improve the economy of the community, particularly for those who keep horses in Takengon, Indonesia.